Simple Binding. 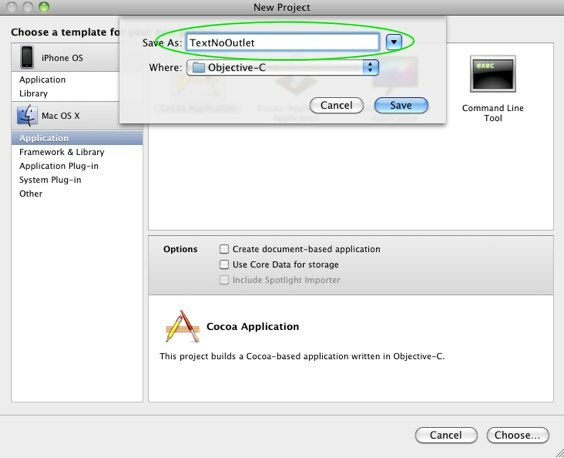 Cocoa GUI Application without Outlets. Experts Exchange > Articles > Simple Binding. Cocoa GUI Application without Outlets. An Outlet in Cocoa is a persistent reference to a GUI control; it connects a property (a variable) to a control. 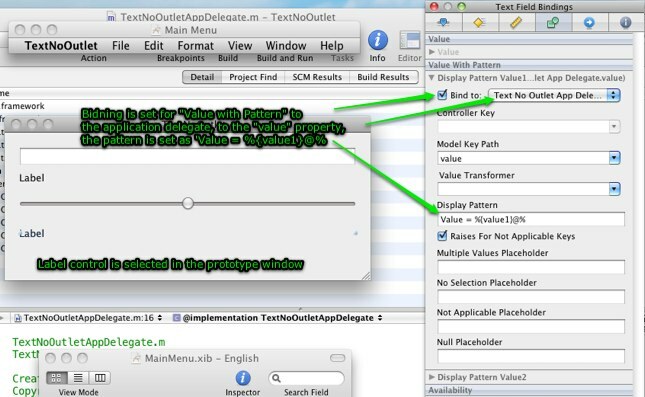 For example, it is common to create an Outlet for the text field GUI control and change the text that appears in this field via that Outlet. The same can be done without manual coding. Doing it via the IDE is sometimes necessary, and it is useful and interesting to know how to do this. 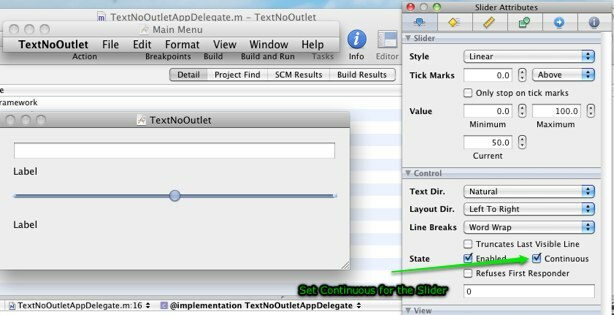 I named the project as TextNoOutlet (shown on the screenshots above). New lines added to the source code have been marked with the comments. Press Control-S here to save the modification. 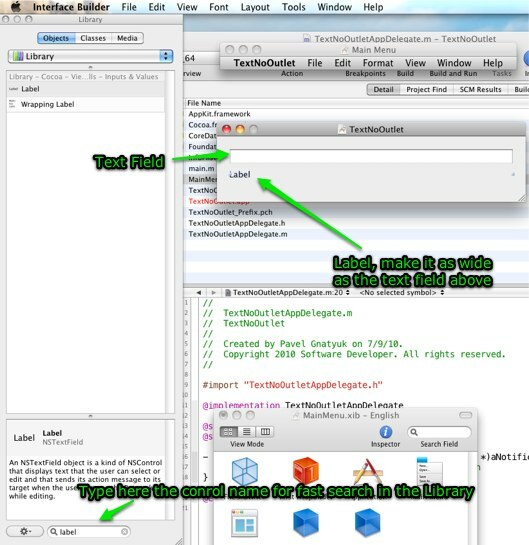 In Interface Builder, click twice on the MainWindow.xib file to open it, I put the Text Field on the prototype window. Let's put a Label control under this text field. Arrange the size and locations. 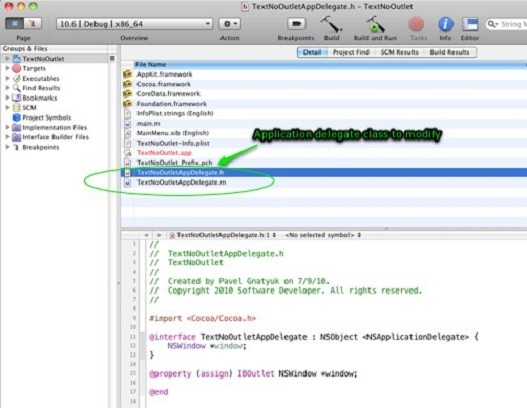 In this step, I connected the text field in my GUI with the property named 'text' from the application delegate class in my source code. Select the label. Press Command-4 to switch to the Binding Inspector. 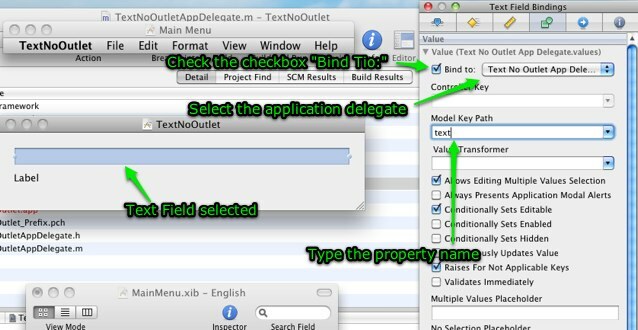 Check the Bind To checkbox, set the application delegate and modify the Modal Key Path in the same way as for the text field. 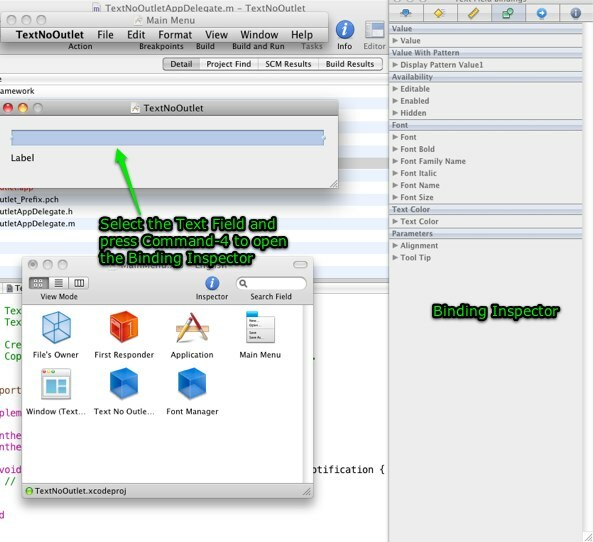 Save your work in Interface Builder (Control-S or Save in the File menu). 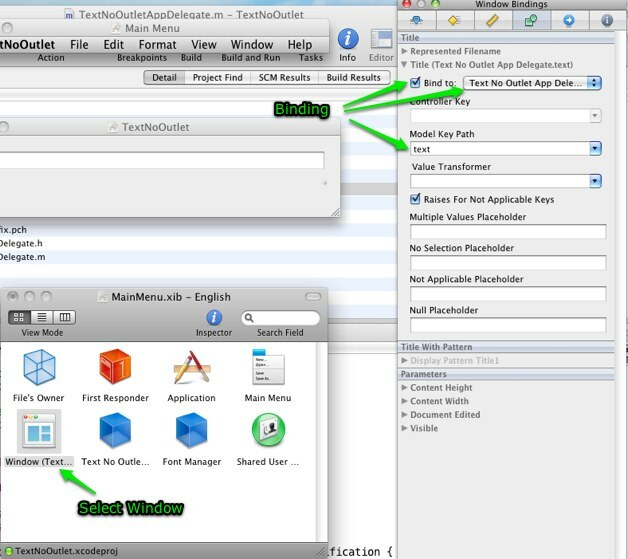 Try to type a text in the text field, press Enter. You will see the text reflected immediately in the label. I'd like to show one more example, this time with the slider control. Same principle: I will add a property, for example 'value', to the application delegate class and bind it with the slider control and a label. 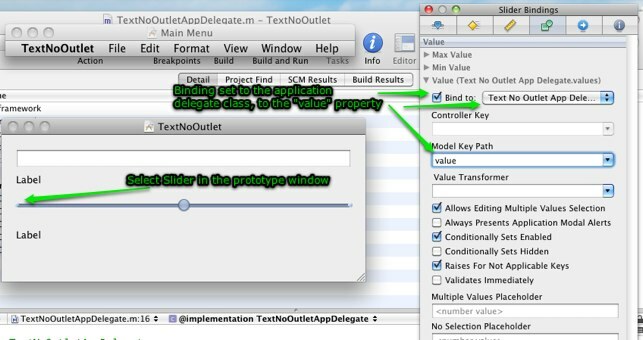 Now I select the new label in the prototype window and will bind it in way that is slightly different from the previous examples -- via "Value with Pattern"
This is all possible because of the nice feature of Objective-C 2.0 - Key-Value Coding or KVC. It is a simple protocol allowing us to set and get values indirectly. The first section of this article showed how to do the binding using Outlets. 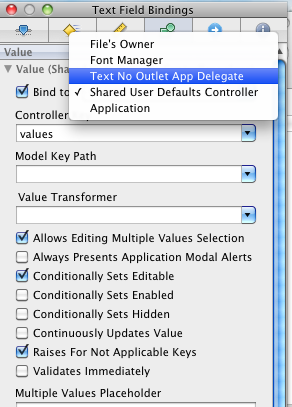 I just used the IBOutlet keyword and then called the methods that get/set a value to/from a control. Then, in the other examples, I specified a key that is used by Cocoa to figure out which property to match up to this key: The property text was added to the application delegate class and key ('text') was used to bind the GUI controls with the application delegate. 1. Mac OS Reference Library. Key-Value Coding Programming Guide. 2. Mac OS X Reference Library. 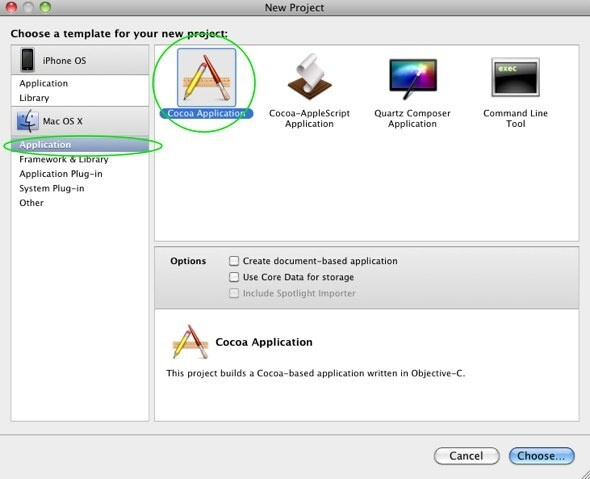 Cocoa Bindings Programming Topics. 4. The Unix Geek. An Introduction to Key-Value Coding in Cocoa.